Dedicate a space that is just for sleep. If you live in a studio with a futon, make it a point to fix up the futon as a couch during the day and as a bed at night. Do not engage in activities that keep you awake in your sleeping area. 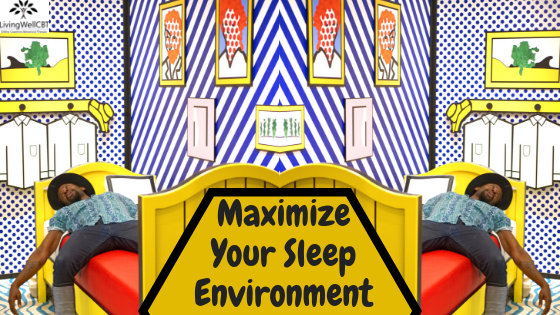 Your sleep area should have a strong association with going to sleep. 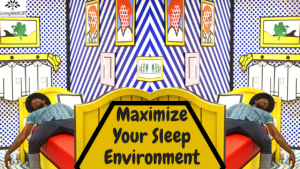 Using the bedroom for wakeful activities will weaken this connection and make it harder for you to sleep. Naps are not a problem for those who do not have any sleep difficulty, but if you struggle with sleep even a brief nap during the day can take away from your ability to sleep at night. Just like your mom told you to not eat a snack before dinner or else you’ll spoil your appetite, taking a nap during the day will spoil your appetite for sleep at night. 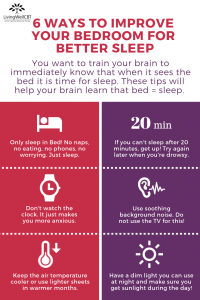 The goal is to strengthen the connection between sleeping more at night and your sleep area. Daytime napping will weaken this connection. If you must nap during the day, keep it under 20 minutes and end it before 2 pm. Watching the clock keeps you awake and can increase your anxiety. Face it away from your bed. The light from the clock can also become a nuisance. If you use your cell phone as an alarm clock, put it across the room so you won’t be tempted to grab it if you cannot fall asleep. This will also help you get up in the morning. Lie down in bed only when you are sleepy: stay awake and out of bed until you feel drowsy. This will help make the SLEEPING AREA = SLEEP connection stronger. Often we stay in bed when we can’t fall asleep hoping that, “at least I am resting” or, “if I am in bed long enough I will eventually get enough sleep.” However, staying in bed when you are not asleep actually promotes insomnia because your brain starts to associate being in the sleeping area with being awake. If you are not asleep within 20 minutes of lying down, get up and go to another area. Go back only when you’re feeling sleepy. Don’t watch the clock for the 20-minute rule – just use your best estimate. Remember that watching the clock is a wakeful activity. 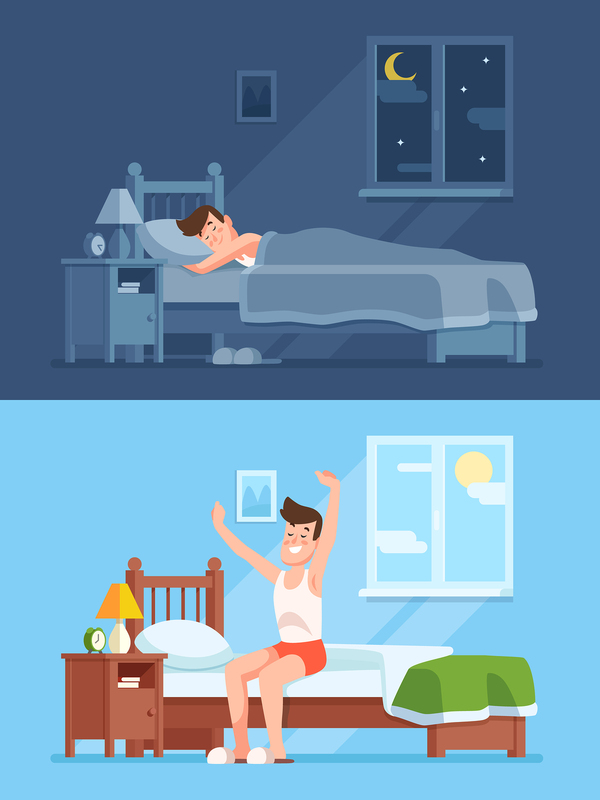 Continue to get up if you’re not asleep after 20 minutes, even if you awaken in the middle of night. Repeat the previous step as often as necessary throughout the night. You may need to do this several times a night for a period of time. Be persistent and don’t give up! Repetition is the key. Plan ahead: before you go to sleep, plan where you will go and what you will do if you wake up during the night. For example, set up a chair in another room with a relaxation tape or reading material so if you need to get up during the night it will be ready for you. 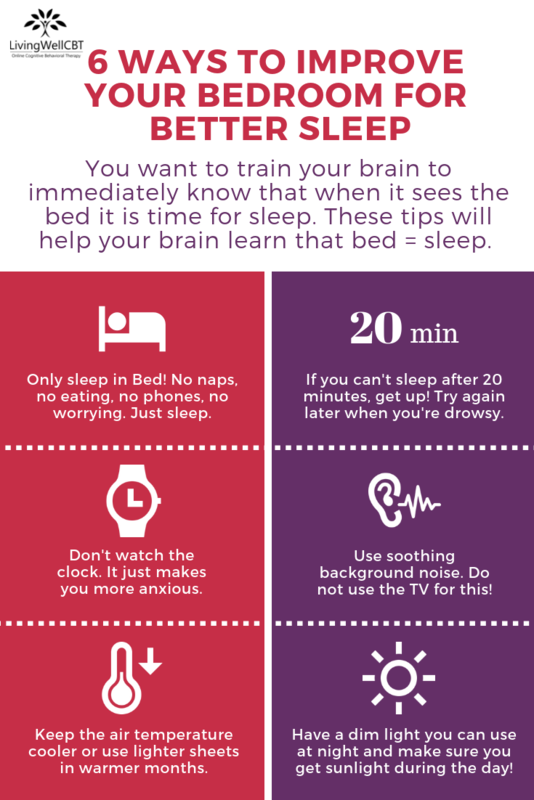 You might need to do your bedtime routine again to promote sleepiness. Some people like steady “white” background noise to mask outside noises that might wake them up. Others sleep better in a quiet room. If you like background noise, try using the radio low and tuned in between stations, a fan, or a “white noise” machine. Don’t use the TV for this purpose! Watching TV is a wakeful activity and should not be done in your sleep area. Also, the noise from the TV is not consistent. Action scenes alternate with dialogue, and commercials are louder than shows, this constant change in volume and rhythm will disrupt your sleep. If your neighbor’s flood lights keep waking you up invest in some blackout shades or turn the direction your bed faces. If you have too many electorincs plugged that all have a glowing power button light, think about how you can plug those in a different room or cover the indicator lights with electrical tape; this will help make your room darker. 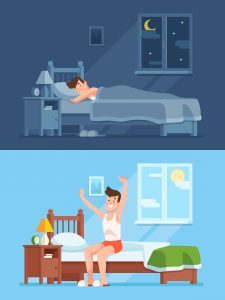 Finally, make sure you are waking up your biological clock by getting exposure to sunlight each day, including in the early morning and early evening. Avoid lying around a dimly lit house at these times. Keep bedroom lighting low. If nighttime is trigging for your PTSD, this will likely take some time to implement. Use a small lamp or other low lighting – this signals to our body that it is evening, which should be associated with sleep. It also cues your body that it is time for relaxation. If you wake up at night have a dim light you can turn on or a night light so you do not have to use the bright overhead lights. Most people sleep better in a room that is slightly cool rather than too warm. A room that is too hot leads to more awake time. Consider sleeping with lighter blankets or even only a sheet during warmer months. If you share a room, making changes to your bedroom will require your partner’s understanding and support. This week your goal is to examine your sleeping environment and make one change to make it more comfortable and conducive to sleep.